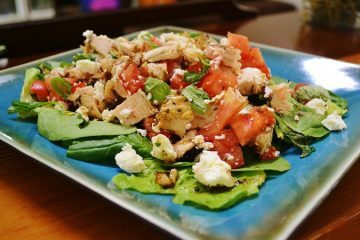 This fresh, crisp salad comes together quickly as the chicken is already cooked and tossed with raw vegetables in a tangy lime-based dressing. The classic Vietnamese chicken salad makes a filling lunch or light dinner, especially welcome during the warmer months of the year. 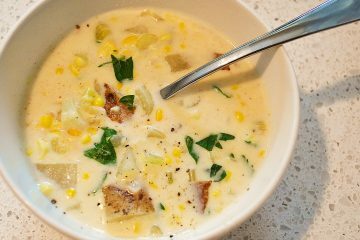 This is a staple go-to recipe in my house. I found a great tutorial in a Better Homes and Garden magazine on making a great chopped salad. Mashing the garlic in salt and letting it sit while you prep the vegetables is the key to a creamy, tangy dressing that set the flavor for the salad. I had fun modifying a classic chopped green salad into a main dish version my family loves (and it’s a great way to sneak a lot of vegetables in too!). 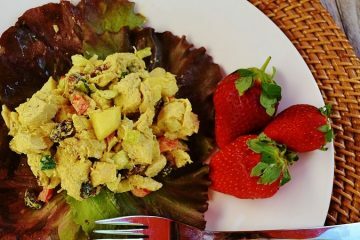 A little protein, a little starch, and a lot of fresh vegetables are my idea of the perfectly balanced whole foods meal. 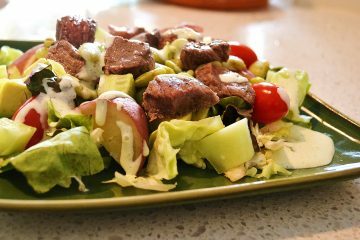 Top it with a creamy homemade ranch dressing and this is a dinner salad sure to please everyone. My transition between the gym and early school pick up usually finds me at Rolling Oats Market so I can heal my muscles with this protein-rich chicken salad. 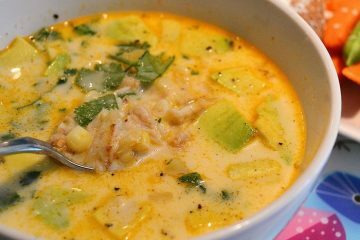 This curried version is one of my favorites from this local natural market. I’ve recreated it at home so that I can enjoy any time of the week. I have suggested scooping the salad into a large Bibb lettuce leaf but feel free to stuff it into pita bread or sandwiched between two slices of bread. This is the perfect tribute to summer’s plentiful tomatoes and fresh herbs. 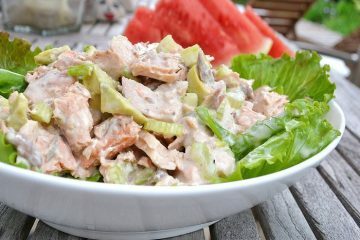 It is light eating during July and August’s sweltering days. I originally prepared this as a “stack” with the salad as a side, but it was so messy to eat that it ended up more as a salad. My family found that this final version is much easier to prepare and eat! 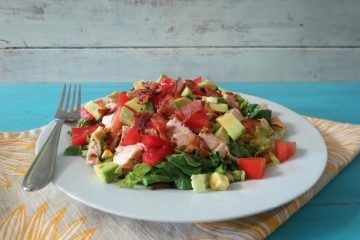 I developed this version of the Cobb Salad to include some of the season’s more popular offerings found in farmer’s markets and our backyards. My family voted for a creamy dressing so I pulled what was growing rampant in my herb garden to accent a homemade ranch dressing. The result was 5 stars, as witnessed by both my daughters going back for seconds! 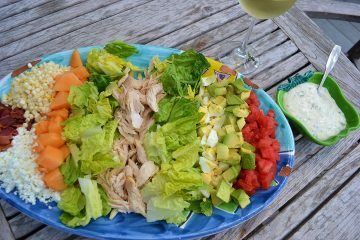 I have arranged the ingredients on a large platter for each person to assemble individually their salad, plus it showcases the rainbow of colors of fresh ingredients found this time of year. It’s a beautiful presentation!